Background: The Louisiana Waterthrush is a small migratory songbird listed as special concern in Ontario under the Endangered Species Act and special concern in Canada under the Species at Risk Act. In Canada, this species occurs predominantly in Ontario, particularly along shaded cold-water streams. Estimates suggest the abundance of Louisiana Waterthrush is fairly stable, but low, with about 105 to 195 breeding pairs occurring in Canada. The Niagara Escarpment provides breeding habitat for the species and is likely the geographic area supporting the largest number of breeding individuals outside of the Norfolk Sand Plain. 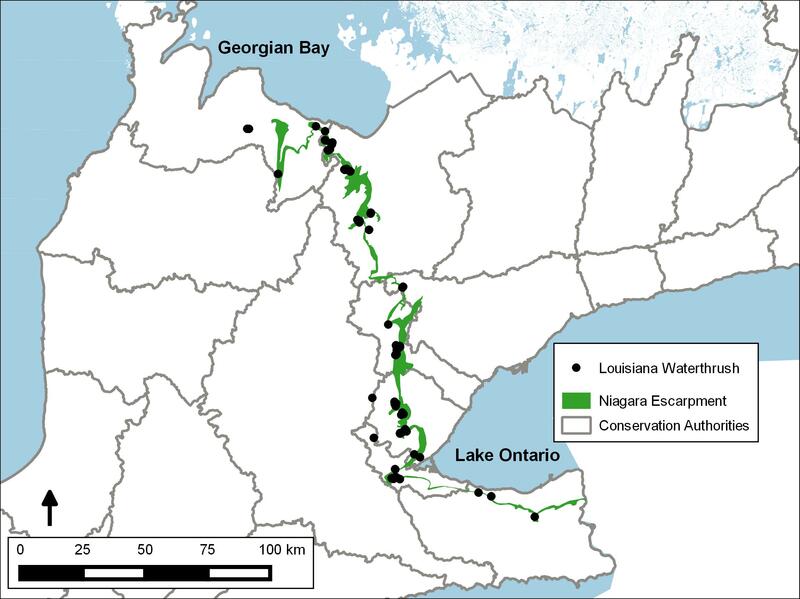 Known detections of the species along the Niagara Escarpment suggest that the species no longer occurs in some areas that were previously occupied. Project work: We used existing data to improve our understanding of the environmental conditions where Louisiana Waterthrush occur along the Niagara Escarpment. We assessed environmental conditions (using geographic information system [GIS] data) and available water quality data for more than 100 locations where Louisiana Waterthrush were detected from 1981 to 2013. We quantified various types of land cover potentially relevant to Louisiana Waterthrush detections at two spatial scales, at the scale of an individual’s breeding territory and a larger landscape context. We also assessed stream order, surface water quality and forest conditions based on Watershed Report Cards produced by Conservation Authorities, and available stream quality assessments associated with Louisiana Waterthrush detections. Conservation implications: Perhaps surprisingly, nearly half of Louisiana Waterthrush detections occurred in areas that had 20 to 60% agricultural land cover within 100 hectares of the detection location. Additionally, Watershed Report Card grades indicated that nearly all Louisiana Waterthrush detections occurred in subwatersheds with a surface water quality grade of B or C. Future research could continue to explore the relationship between Louisiana Waterthrush detection locations and available GIS-based environmental data and water quality data. This research could explain why Louisiana Waterthrush still occur in some areas because this species is sensitive to poor water quality and much information has already been collected about water quality and the invertebrates on which the species feeds. Funding: BECO was contracted by Environment Canada to carry out this research.